The government does not control the weather. It does, however, exercise significant power over scientists’ ability to produce reliable forecasts. Sequestration, the current budget crisis plaguing Congress, threatens widespread automatic spending cuts for all federal agencies starting March 1st. The National Oceanic and Atmospheric Administration’s satellite program is one of many facing disruption. The agency’s current polar-orbiting weather satellite, Suomi NPP, is due to retire in 2016. Without funding to develop and launch a replacement, there will be a significant decline in the amount of data available for the computer models that are used to forecast the weather. Simply put, less data means less accurate forecasts. This will be especially important when meteorologists try to determine the path of future life threatening weather events like hurricanes and blizzards. The sequestration is also expected to cut billions of dollars in federal aid to the victims of Hurricane Sandy and reduce FEMA’s ability to respond to future natural disasters. Large snowstorms, like the recent northeastern Blizzard, can lead some people to question the existence of global warming. According to scientists, however, these intense snowstorms are actually signs of our changing climate. Significant snow events require both a deep supply of moisture and freezing temperatures. The cold temperature part of this equation is a natural part of the winter season, which is itself, a result of the tilt of the Earth’s axis. Here in the northern hemisphere, winter means our half of the planet is tilted away from the sun and therefore receives the least amount of solar energy all year. While global warming will not change the tilt of the Earth’s axis, it is affecting the moisture content of our atmosphere. Rising levels of greenhouse gases are warming the air, which in turn, allows it to hold more moisture. As a result, storms are producing more intense precipitation, including heavier than normal snowfall when given the proper conditions. As global temperatures rise, scientists say we should expect to see more large storms, but less snow overall in the winter season. The window for typical winter weather is also expected to shrink, as spring-like conditions continue to arrive earlier than in the past. “Forward on Climate“, the largest climate rally ever held in this country took place yesterday afternoon in Washington, DC. The event came just five days after President Obama’s State of the Union Address, in which he called on Congress to take action on climate change. 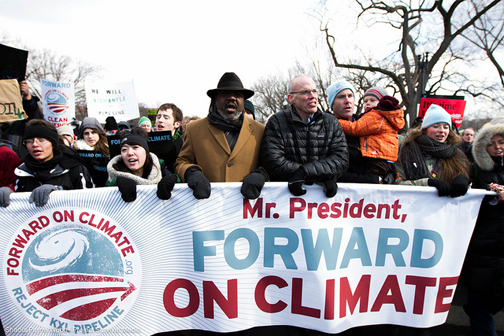 According to organizers – a variety of environmental groups – an estimated 35,000 concerned citizens from thirty states braved sub-freezing temperatures to rally on the National Mall and march to the White House. In doing so, they urged lawmakers to reduce U.S. carbon emissions and support renewable energy. Many of the attendees, however, were specifically imploring the President to reject the Keystone XL Pipeline construction proposal. If approved, the pipeline would carry Canadian tar sand oil across America’s agricultural heartland to refineries along the Gulf Coast. The consequences of a spill in this region would be catastrophic to farming, ranching, and the Ogallala Aquifer – an immense underground supply of freshwater used for drinking and irrigation by millions of people. Tar sand oil is a viscous fossil fuel that is heavier and dirtier than conventional crude oil. Its extraction process is also extremely energy intensive. According to a National Resources Defense Council report, the production of one barrel of tar sand oil releases three times the amount of greenhouse gases compared to one barrel of traditional crude. Environmental groups see the approval of the pipeline as not only sanctifying the production and use of tar sand oil, but also extending this country’s economic reliance on fossil fuels and increasing carbon pollution. The President also urged Congress to pass legislation that would combat climate change by reducing carbon emissions and further developing cleaner, more sustainable sources of energy. A massive winter storm clobbered the northeastern Unites States overnight. 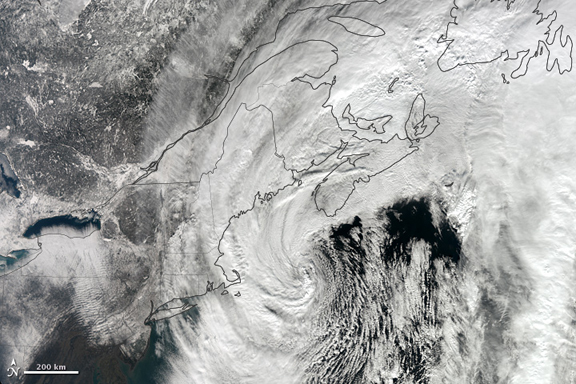 Snow accumulated from New Jersey to Maine with some areas collecting more than three feet. This storm was a classic winter nor’easter. It formed when two weather systems – one with cold air coming in from the west and the other with warm air approaching from the south – merged and moved up the coast. The deep moisture content of this particular event, however, helped make it an exceptional snow maker. In producing both heavy snowfall and powerful winds, this storm brought travel of all kinds to a standstill across the region and caused widespread power outages. Some communities also experienced coastal flooding. In New York City, we received 11.4 inches of snow in Central Park. While this was a minor accumulation compared to nearby cities and towns, it was the most snow the Big Apple has seen in two years. The winter season can produce a number of different types of storms. Recently, Alberta Clippers have been dominating the forecast in the eastern United States. An Alberta Clipper is a fast moving winter storm system that originates in the Canadian Rockies, specifically in the province of Alberta. Once formed, these storms tend to get caught up in the jet stream and travel southeast across the US. Alberta Clippers, unlike nor’easters, usually do not produce large amounts of snow. Moving quickly over land, they generally lack significant moisture. Clippers are, however, known for their strong winds and cold temperatures. This type of storm system takes its name not only from its place of origin, but also from the clipper ships of the 19th century – the early days of meteorology. Back then, clippers were the fastest sailing ships of the time. 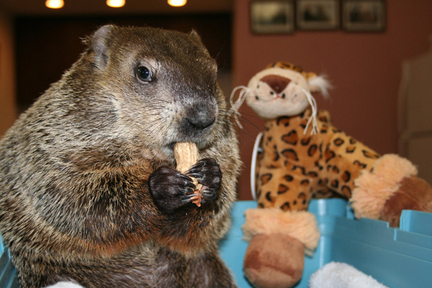 Today is Groundhog Day, the halfway point of the winter season. In New York City, our local weather-groundhog is “Staten Island Chuck”. This year, he did not see his shadow and is predicting an early arrival of spring-like conditions for the city. 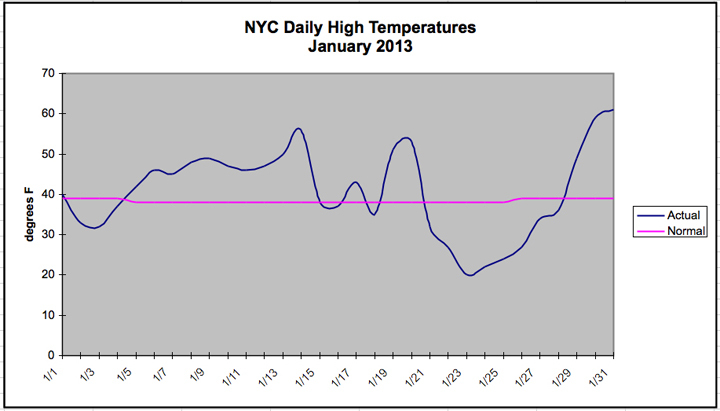 January, the dead of winter, is typically the coldest month of the year in New York City. This year, despite the frigid arctic blast toward the end of the month, temperatures were mostly above average. In the end, the city’s monthly temperature registered 35.1°F, which is 2.1°F above normal. In terms of precipitation, NYC was mostly dry. We collected 2.76 inches of rain, which is 0.89 inches below normal. Snowfall was also lacking. Only 1.5 inches was measured in Central Park. On average, January usually brings the city 7.0 inches of snow.